After a week of no power due to Winter Storm Alfred, we made our way back to Jay's tonight. New local, Mike Brennan, hopped in with Steve and I to head out to the ramp. 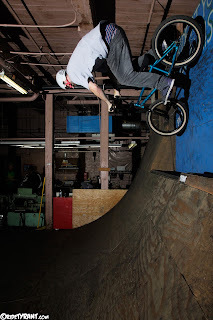 It was a typical laid back Tuesday night session...dudes, bikes, pizzas, and the ramp. I'm hoping these sessions keep up throughout the Winter! Always a good times at Jays! !